Florida’s organ, tissue and eye donor registry is named for Joshua Abbott, the recipient of a lung transplant who passed away in 2006. Abbott’s story so moved the Florida legislature that, in 2009, Florida’s Agency for Health Care Administration chose Donate Life Florida to create a statewide donor registry to increase registry enrollment and educate Floridians about donation. Donate Life Florida is a non-profit 501(C)3 charitable organization. 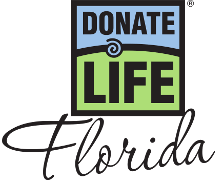 Established in 1997 as Florida Coalition on Donation, Inc., Donate Life Florida is dedicated to motivating Floridians to designate themselves as organ, tissue and eye donors, so lives are saved and enhanced through donation and transplantation. If you already have “organ donor” on your driver license, you may access and customize your profile and donor designation record. Today, more than 5,000 patients listed at Florida transplant centers await life-saving organ transplants. Many of these individuals may get a second chance at life due to the generosity of those who designate themselves as organ, tissue and eye donors on Florida’s organ and tissue donor Registry. You have the power to Donate Life! Sign up today to become an organ, tissue and eye donor. Your generosity can save up to eight lives through organ donation and enhance dozens more through tissue and eye donation. View our 2017 Annual Report.